We are a small collection of people who believe wholeheartedly in a grass roots agricultural movement committed to changing the current food system, one micro farm at time. As the founder and visionary of Twitter Creek Gardens, and a life long Alaskan, I'm determined to provide a food alternative to the grocery store chains Alaskans are prone to. You can almost always find me in the field. Originally from Texas, Allison got her first taste of farming in the Virgin Islands. Lucky for us, she came to Homer looking for an adventure and found a place to call home. Her determination, intuitiveness, ingenuity, and passion for farming are enormous benefits to this farm and our food. We are so fortunate to have her. Colin's list of tasks are endless. From gate building, to small engine mechanics, Colin keeps the systems running smoothly. His level headed approach and insatiable desire to conquer any task are invaluable to our operation. When not on the farm, Colin can be found teaching outdoor leadership skills to our next generation of land stewards through the National Outdoor Leadership School (NOLS). Delivery driving, event set-up, and extra hands on any project are just a few of the tasks for these two. The willingness to come at the drop of a hat and aide in any number of farm tasks is an asset we can't live without. Interns: It is important to us at Twitter Creek to perpetuate the education of young farmers. 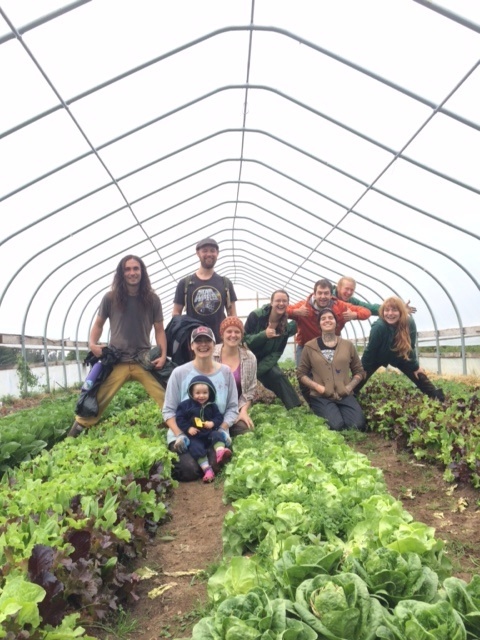 Our goal in offering internships is to provide a comprehensive experience in the world of micro farming in Alaska and to inspire more people to farm! We offer two internships a season. Work Traders: Each year we trade five small CSA shares for individuals willing to commit to a four hour shift each week. Work traders are responsible for a large portion of the weeding that takes place in the fields. We LOVE our work traders. This farm has come to fruition by the backs and hands of countless individuals. From tech support to logo design, Farm to table Chefs to tractor operators, our crew is expansive.